Every Korean is born a forager. would recognize cradled beside zucchini and spinach atop their bibimbap bowls, start out green, tough and somewhat alien-looking on the side of the road. They are picked, washed, boiled, spread out and sun-dried on sheets of orange tarp before they are stored, sautéed with garlic and coated with sesame oil. They know that the modestly fragrant white flowers are hiding wild potatoes beneath the layer of earth, those pebbles barely larger than thumbs. They know that young, blushingly pink azalea flowers are to be collected gently in a basket and pressed on top of rice cakes. A lot of this is lost on me. People my age may be the last born to a generation reared in a largely rural Korea, where men and women were everywhere hunched over rice paddies, pants rolled up to the knees and ankles dipped in muddy water. They have stories of walking over many hills, cloth sacs of books bunched up around the waist, to go to school where chalkboards were black and dusty and gentle teachers wielded their sticks. Lunch time was spent envying the kid whose tin container of rice and kimchi is adorned with the much-coveted fried egg – the unmistakable sign of belonging to the one landowning family of the village. Perhaps his family even had a black and white television. These children grew up, moved to cities and had babies. They bought us Gameboys, hamburgers and Barbie dolls. We couldn’t tell the difference between raspberries and mulberries. Our parents knew exactly what to do in mountains. My generation, unless unusually keen or born to particularly eager mountaineering parents, is generally clueless and doesn’t particularly mourn the loss of knowledge. Why would we, a generation at happy comfort with mid-winter shrink-wrapped strawberries from the mega market? 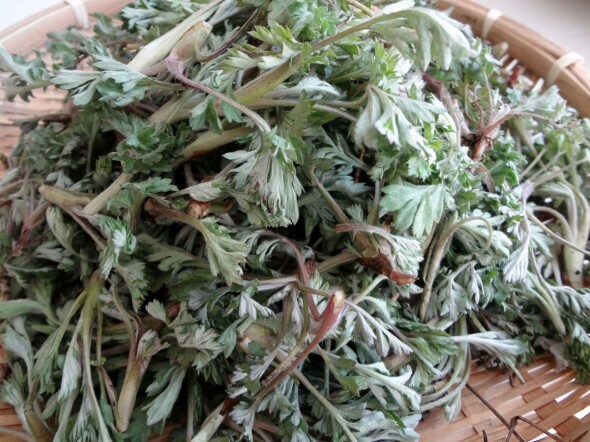 But about mugwort, we know. Mugwort, we are familiar with. I’ve had a hankering for some throat-clearing, spicy soup lately. It’s getting cold and dark and dreary and this is precisely the time of the year when you want something hearty, indeed BEEFY. But that looks like a super hearty, authentic, Korean-mom-in-your-kitchen kind of soup! I can’t make that! I’m white! Come to think of it, I’m not even white but I FEEL like I’m white because all I’ve ever made is mac and cheese from a box! I fail in being ethnic! AHHHHH I AM GOING TO KILL MYSELF! Stop it right there! No need to resort to self-harm! That’s what Plus One Cook is here for, and you, too, could put this on your dinner table!